Open Saturday and Sunday in late September and October. Pick your own pumpkins or buy pre-picked pumpkins at the concession stand. Don’t forget to leave time to get lost in their corn maze! Be afraid in their haunted maze the last two weekends in October. Flashlight maze on Halloween night. Playground attractions include horse swings, spider web climbing rope, corn box, slides and bounce house. The address is 34079 Impala Trail, Barnard, MO. It is about 34 miles north of St. Joseph. A working farm operating since 1895, it is open Wednesday through Sunday in October. Admission to their harvest festival is $11 per person. The farm has had a corn maze for more than ten years. Have fun at their pick your own pumpkins, wagon rides, pig races, rope maze, monster slide, pumpkin tetherball, haunted barn and paintball shooting gallery (extra charge). The address is 2319 State Highway U, Sikeston, MO 63801. It is about 24 miles south of Cape Girardeau. General admission includes kids 4 acre cornfield maze, pick your own patch, pumpkin painting (with purchase of a pumpkin), hayrides, scavenger hunt and kids play area with fort, swings, bounce house and tractor choo choo train. Nighttime 8 acre haunted maze and karaoke on Friday and Saturday nights in October. Additional charges for face painting, pony rides and bonfires. Open on Fridays, Saturdays and Sundays from late September through early November. The address is 177 Carob Rd., Clever, MO. The location is about 22 miles south of Springfield. A family farm that opens weekends starting the last weekend in September. The address is 25371 State Highway 46, Maryville, Missouri. Enjoy 7 acres of twist and turns at one of the area best corn mazes with much more fun.æ Exeter CornæMaze has a huge pumpkin patch, a giant orange pillow for their pumpkin jump, a zip line, pumpkin cannon, hayride, cow train, campfires,æZombie Paintball, Haunted Barn, concessions and more.ææLocatedæless than 30 minutes from NW Arkansas.æ Address is State Highway MM, Exeter, MO 65647.æ Opens around September 19th through Halloween. A family farm with over a 40 acre pumpkin field, 10 acre corn maze, apple orchard, hayrides and a variety of farm animals, straw maze and corn box. Opens Friday, Saturday, and Sunday starting in late September. Admission with maze is $6. Without maze, $3. The location is at 1905 Mokane Rd., Jefferson City, MO 65101. It is about 2 miles from downtown Jefferson City. Sorry folks this pumpkin patch and farm are permanently closed. Herman’s Farm Orchard has been in business since 1985. They offer hay rides and pumpkins that you cut right off the vine. They also have u-pick apples and kid’s play area. They are open daily in season. The location address is 3663 N Highway 94, St Charles, MO. It is about 26 miles northwest of St Louis. A small orchard 25 miles from Columbia. They started allowing u-pick pumpkins and apples starting in 2000. Richard and Pamela Huffstutters own and manage the family farm started by his parents, Betty and Ralph, in 1958. The address is 2621 State Route P, New Franklin, MO 65274. They feature apple cider, apples, peaches, pumpkins, hayrides and fresh baked pies. The address is 14615 State Route K, Amazonia, MO 64421. It is about 11 miles north of St. Joseph. This is an outdoor agricultural entertainment complex open every fall. They feature a giant corn maze and a pick your perfect pumpkin patch. They also have a hay mountain, wagon rides, bounce house, and field trips. The address is 28496 Nature Lane, La Plata, MO 63549. It is about 78 miles north of Columbia, MO. Admission is $6 per person. Children six and under are free. Bring your flashlight to enjoy the maze at night. Enjoy the hayride and fresh air. They open around September 12th. They are located on Bryant Bottom Road, Blackwater, MO. It is about 39 miles west of Columbia. Fun in September and October includes pumpkin patch, hayrides, straw tunnel, bounce house, puppet shows, and a concession stand. Extra charge for barrel train rides, zip lines and sling shot. Opens in late September. Pumpkin fun started here in the fall of 1997. It is open most Friday, Saturday, and Sundays. The address is 4610 Forest Park Road, Sedalia, MO 65301. It is about 63 miles west of Jefferson City. Their fall activity is Papa Charlie’s Pumpkin Patch which include pumpkins patch, a corn maze, train rides, 20 foot bouncing, hay mountain, zip line and lots more fun. They are open every day in starting September 29th. The address is 8554 Liv 511, Chillicothe, MO 64601. It is about 70 miles east of St. Joseph. A small, working family farm that lets you pick your pumpkin right off the vine. Enjoy pumpkin patch, wagon rides, a corn maze, farm animals, pre-picked pumpkins, corn pit and other activities. Perryville Pumpkin Farm was started in 2001 but sits on a farm dating back to 1892. It is open seven days a week from September 4th through October 31st. The address is 1410 Allen Landings Road, Perryville, MO 63775. It is located 40 miles north of Cape Girardeau. Open on Saturday and Sunday starting in late September. It features large pumpkin patch, hay wagon ride, hay tower, barrel cars, super slide, bounce house, farm animals, swings and choo choo train. Many new attractions this year, including 100 ft gunny sack slide, Totally Tubular Tire Patch, and 24′ goat tower. Admission is $6 per person, including all activities. Pumpkins are available by the pound. The address is 18385 S. US Hwy 63, Rolla, MO. It is about 60 miles south of Jefferson City. A small farm in the Ozarks owned and operated by Richard Witt and his family for more than 20 years. Corn maze and pumpkin picking open daily from late September through early November. Hayrides run every 15 to 30 minutes throughout the day. The address is 22813 Hwy ZZ, Marionville, MO 65075. It is about 26 miles southwest of Springfield. Pick your pumpkins in the pumpkin patch. They are located between Washington and Hermann about an hour west of Saint Louis and an hour southeast of Columbia. Other activities include the 5 acre maze of corn, farm animals and kiddie corral. Open on Saturdays and Sunday in October. The address is 2431 Highway E, New Haven, MO 63068. They open weekends starting around September 19th. The address is 10757 Highway 65, Cole Camp, Missouri. It is about 60 miles west of Jefferson City. Opened in 1988 by the Mikus family. 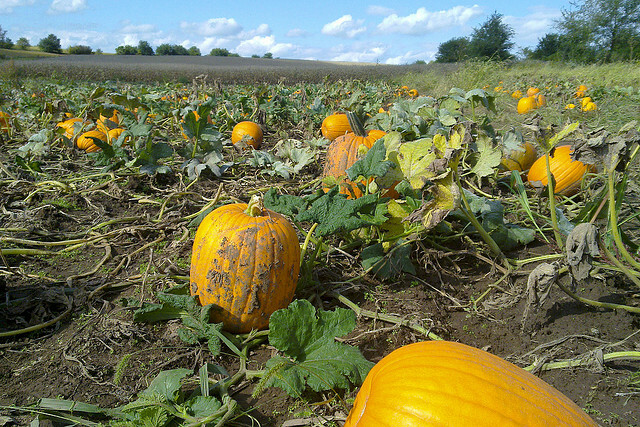 They now grow over 100 acres of pumpkins on this 180 acre farm. Weekday fun includes straw maze, bounce house, pedal tractors, swing set and petting zoo. Weekend fun includes pony rides, horse-drawn wagon rides, face painting and live music. Free admission and many of their activities are free. They are open from the last weekend in September through Halloween. The address is 26415 South Stringtown Rd., Wright City, MO 63390. It is located about 51 miles west of St Louis. It feature u-pick apples and vegetables including pumpkins. They also sell Christmas Trees and feature farm tours. The address is 5455 SE State Route FF, St. Joseph, MO 64507. It is about 7 miles south of St. Joseph. A fourth generation family owned vegetable farm. U-pick and pre-picked pumpkins for sale. Activities include farm animals, hay rides, pony rides, corn maze and inflatables. They also have an inflatable haunted house. Located south of St. Louis between Fenton and Arnold. About the farm: Walter Stuckmeyer and his wife, Marie Keller, started the original farm at another location in 1935. They bought 12 acres at the current location in 1964. It is now a fourth generation farm consisting of more than 200 acres. The address is 249 Schneider Dr., Fenton, Mo 63026. It is about 21 miles south of downtown St Louis. Over 20 years of autumn harvest fun with pumpkins and hay rides. A variety of pumpkins available from the last weekend of September through the end of October. Also have fun with their straw castle maze and bounce house. Gourmet foods available in the pole barn. Free admission. The address is 16704 New Halls Ferry Road, Florissant, MO 63034. It is about 21 miles south of St Louis. The address is 30094 Route A, Lentner, Missouri. It is about 60 miles north of Columbia. Located in the northwest corner of St. Charles County five miles from Wentzville. Open every weekend from October 6th from 10 AM to 5 PM. Free admission. On weekends enjoy the hay ride ($2), mini barn hay maze, barrel train ($2) and gold panning ($6). The address is 1125 Dietrich Rd., Foristell, MO 63348. It is about 49 miles east of St Louis.